BSNL introduced Full Talk Value Offer under GSM Prepaid Mobile Services on occasion of upcoming festivals. 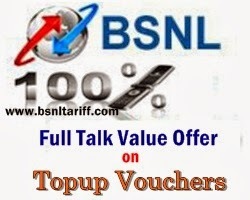 PAN India Telecom Public Sector Unit (PSU) Bharat Sanchar Nigam Limited (BSNL) has launched Full Talk Value offer on Topup vouchers under GSM Prepaid Plans Mobile Services across Gujarat Telecom Circle. The competent authority of BSNL Gujarat Telecom Circle has decided to announce Full Talk Time offer on Topup denomination of Rs.220/- for limited period as promotional basis in Prepaid Plans services. This offer will be available for Gujarat telecom circle customers with effect from 17-12-2013 to 16-03-2013.